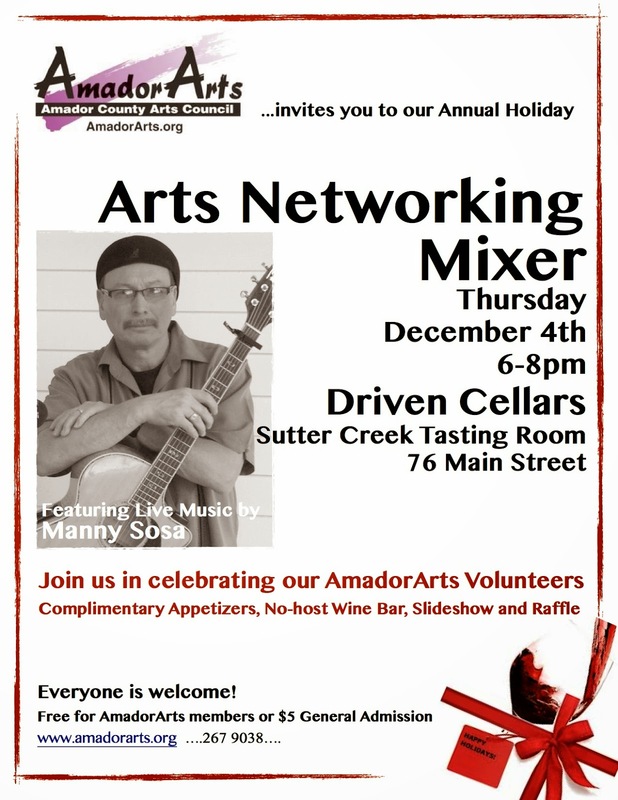 Don’t miss the next AmadorArts Networking Open House on Thursday, December 4th, from 6:00 to 8:00 pm, at the new Driven Cellars Tasting Room located at 76 Main Street in Sutter Creek. This quarterly event is described as a Mixer for the Arts bringing everyone together,and this one will honor the many volunteers whose support keeps the non-profit ticking throughout the year. 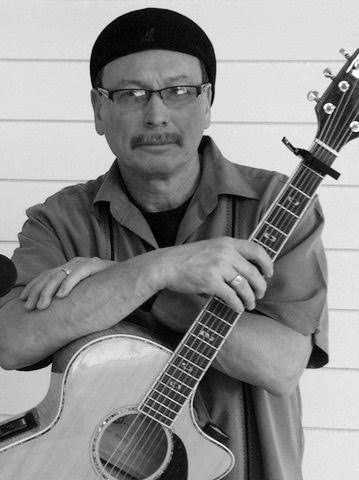 There’ll be music performed by Manny Sosa, guitarist/vocalist. Join in the merriment while enjoying complimentary sumptuous appetizers catered by Cavana’s Deli, a new eatery in Sutter Creek, and a no-host wine bar. There’s always a raffle and other surprises. For AmadorArts members and volunteers the event is FREE; for all others the cost is just $5 a person. PHOTO: Manny Sosa will provide music at the Arts Mixer Dec. 4. The Interfaith Community Choir and Orchestra invites everyone to the 15th Annual Festival of Carols, a choral and symphonic concert benefiting the Interfaith Food Bank of Amador County. Please note: because of the popularity of these concerts, the location and days have been changed to accommodate the community. This year's concerts are scheduled the weekend before Thanksgiving, Saturday, Nov. 22nd at 7 p.m. and Sunday, Nov. 23rd at 3:00 p.m., at Grace Fellowship Church, 8040 S Hwy 49, Jackson. The generous support of local business owners and community members continue to make this annual event free and open for all. A light refreshment will be served after Saturday night’s concert, followed by a meal after the second concert on Sunday afternoon. Childcare will be provided and a goodwill offering will be accepted at both programs. 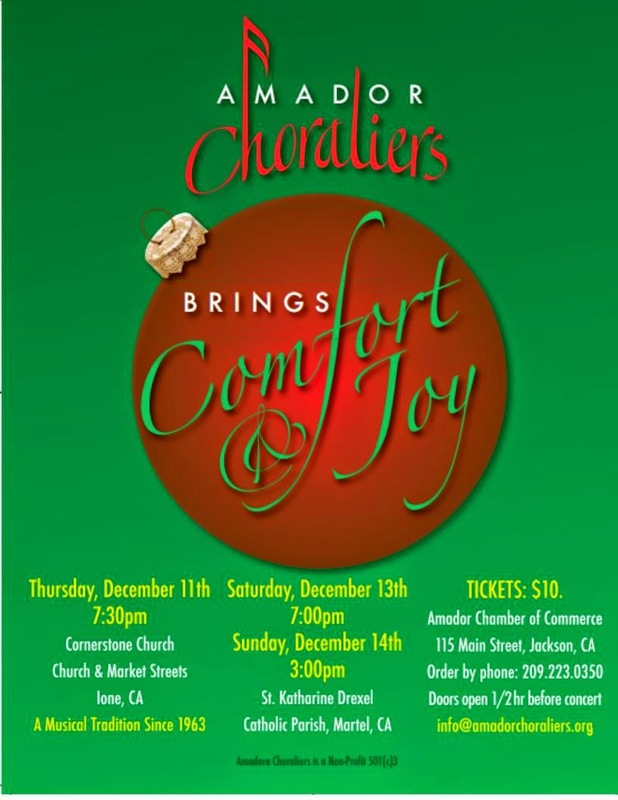 All proceeds from the concerts go directly to the Interfaith Food Bank of Amador County. This year’s concerts include a rarely heard piece by G.F. Handel for voice and trumpet accompanied by strings and continuo entitled, “Eternal Source of Light Divine”- a precious piece showing Handel’s lyrical mastery, sung by local soprano, Marie Bedard. Two musical gems will be presented, the first, by Gusalv Holst, entitled “Christmas Day” for chorus and orchestra, and the second, “The Dargason,” which includes the familiar carol, “What Child is This” also known as “Greensleeves”, for string orchestra and oboe. Both the Interfaith Chorus and Orchestra is made up of highly skilled youth musicians and amateur and professional adult musicians from Amador County and surrounding areas. Local dramatic tenor, Bill McKenna will be featured in the movement “Every Valley”, from Handle’s Messiah. Also on the program are a variety of early American hymns and spiritual songs, African style chorus, congregational singing and much more. All are encouraged to join with the Interfaith Community Choir and Orchestra this year to offer support for the Food Bank and to usher in the Thanksgiving and Christmas season with quality choral music, sing-a-longs, great food and the special testimony of those who have been in need and have found aid, both physically and spiritually. For more information, call 223-2834 or visit www.icchoirs.org or www.feedamador.org. 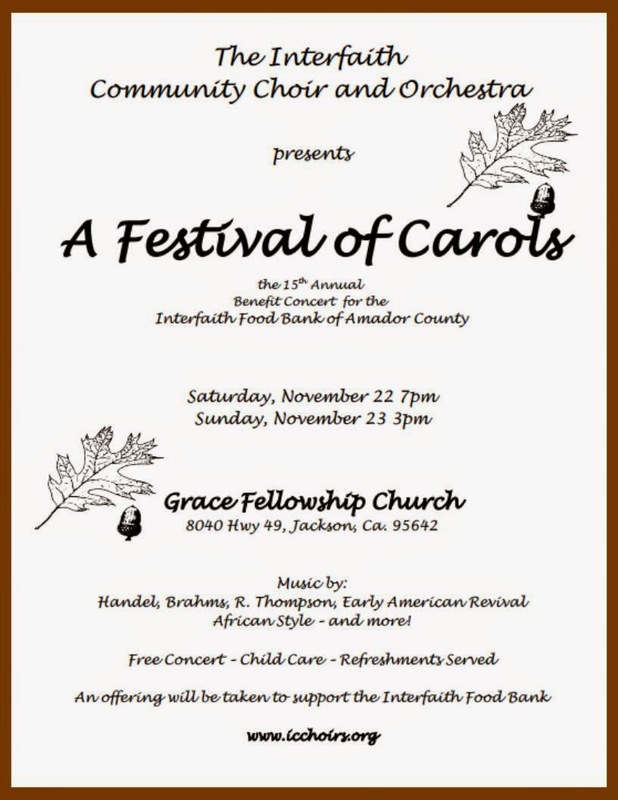 Those unable to attend either of these two concerts may send a tax-deductible holiday donation directly to the Interfaith Food Bank, 12181 Airport Road, Jackson 95642. Donate online or send in a check payable to the Interfaith Food Bank. 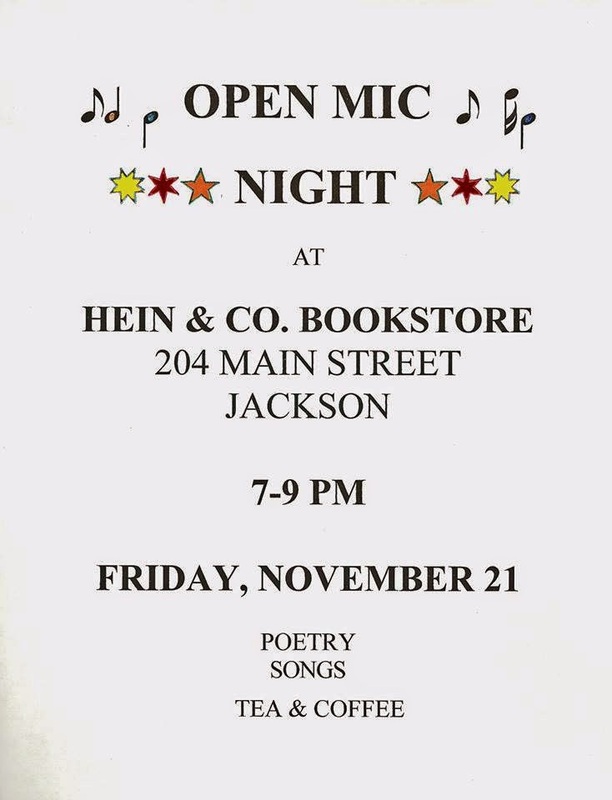 ANNOUNCING THE “FINAL FRIDAY” OPEN MIC - Every last Friday of the month from 7-9 pm at at Hein & Co. Bookstore 204 Main Street in Jackson. 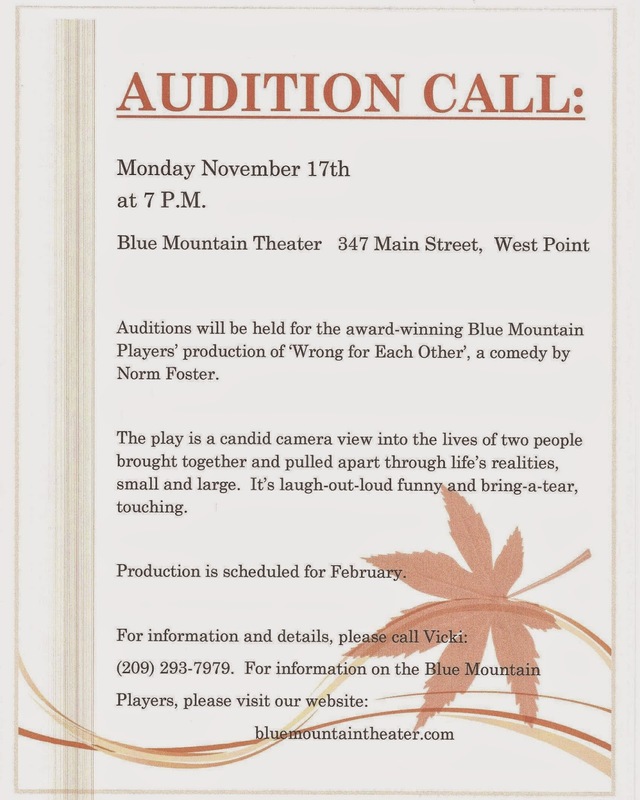 Bring poems, songs or stories you've written, to share,or just listen to local poets/musicians perform their work. Free event, donations for bookstore always welcomed. Hope to see you there! DEC 7 - “Operation Christmas Contact” at the National Guard Armory, Stockton Airport, CA...SUPPORTING OUR TROOPS! JACKSON RANCHERIA’S KARAOKE SERIES - The Jackson Rancheria is bringing back their popular Karaoke Series every Wednesday night from November 5 to December 10. Contestants will be able to compete to win cash prizes and a chance to face off in the Karaoke Finale on December 17, 2014! All entries will be placed in a drawing drum and the Karaoke Host will choose participants at random. Contestants will be judged on Vocal Ability, Entertainment Value and Audience Response by our panel of three judges. After all of the contestants have performed, the judges will tally the scores and the Karaoke Host will announce the winner on stage. The first place weekly winner will receive $300, the second place winner will receive $200 and the third place winner will receive $100. Weekly winners who accept the invitation to sing in the Karaoke Finale will be battling it out for their share of $6,000! The top 10 finalists will be awarded! First place winner takes home $2,000, second place wins $1,500 and third place wins $1,000! Doors open at 6 p.m. for all events. Contestants must be registered and have their song selection turned in by 6:45 p.m. to be eligible to compete. The contests begin at 7 p.m.
All ages are welcome to attend, but only 18 years or older to participate. No host bar and food available.